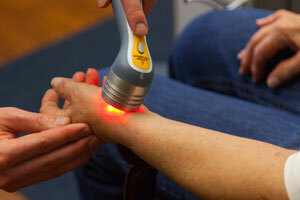 Cold Laser Therapy (CLT), has been found to reduce acute inflammation, pain, and accelerates soft tissue healing. Immediately after an acute injury, the body's natural response to the disruption of the integrity of vascular, soft tissue, connective tissue, and neurological processes, is to initiate a series of biological responses, being endema/swelling. Instead of exacerbating the inflammatory process, CLT condenses the time frame from onset to resolution by 30 to 50 percent when used immediately after the injury. One of the truly unique characteristics of CLT is it's ability to actually promote and enhance healing, not just treat the symptoms. 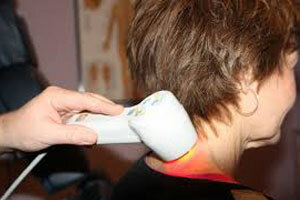 The irradiation by the low-level laser light accelerates and enhances healing activity carried out by the body. 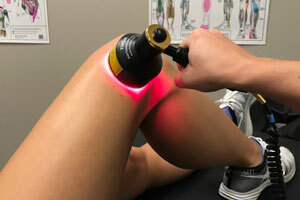 An example of the laser's ability to heal soft tissue would be a typical hamstring injury. 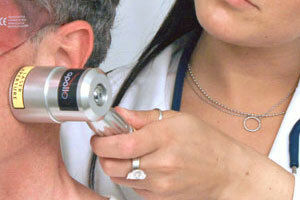 Typically it takes at least 7-10 days to heal, but with the use of the cold laser it cuts the healing time to 2-3 days. Unlike surgery treatment, CLT is non-invasive and requires no healing time. There are also no gels that have to be applied before treatment unlike ultrasound. The most notable sensation is the pressure of the head of the laser on the skin, however some patients report a small amount of tingling. CLT, stimulates the cell's mitochondria into hyperactivity which provides the cells with more energy and allows them to be in optimum state to perform better, faster, and more effective. 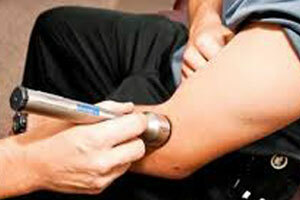 The result is wound and injury healing that is vastly enhanced and takes dramatically less time to complete. Most cases require fewer than 12 treatments and are affordable.